Author: François Dell, Mohamed Elmedlaoui. Series edited by: Harry Stroomer. 8 pp. Roman, 274 pp. The present book deals with the metrical form of texts in the songs of the Tashlhiyt Berber. Tashlhiyt Berber is a language of western Morocco spoken by around five million people. The Tashlhiyt Berber singing tradition uses a wide array of different meters. The authors encountered over a hundred different meters, with length ranging between four to twenty syllables. They claim that these meters do not form a fixed list whose members are memorized one by one by native speakers. Rather, they are generated by a productive system which is analyzed here. The authors’ starting point is the ground-breaking work on versification in Tashlhiyt Berber and Tamazight Berber by Hassan Jouad. His most important discovery about versification in these languages is that it is based on a distinction between heavy and light syllables, and that if two strings of words are built on the same meter, they have the same number of syllables, with heavy and light syllables arranged in the same order. Whereas the best-studied meters in the world’s poetic traditions are periodic, that is, built up from successive repetitions of the same pattern, Tashlhiyt Berber meters are apparently aperiodic. Nevertheless, the authors argue that a subset of these meters have a four-mora periodicity. The first chapters of the book deal with basic notions on texts and tunes and with foot structure; they present the outlined meter system and define ‘straight’ meters and their alignment with the musical beats in the songs. The following chapters address general issues like the division of verse into successive syllabification domains, text settings at the syllable level and below, and levels of representation for the correspondence between text and tune in singing. 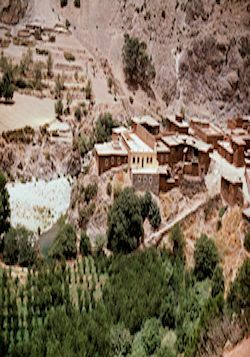 The book contains complete transcriptions of nine Tashlhiyt Berber songs. The accompanying CD-ROM includes recordings of all these songs. Additionally, the CD-ROM contains the free software application Audacity which displays annotated sound waves for all the songs. The labelling allows readers to easily locate any line or portion of a song and play it repeatedly. 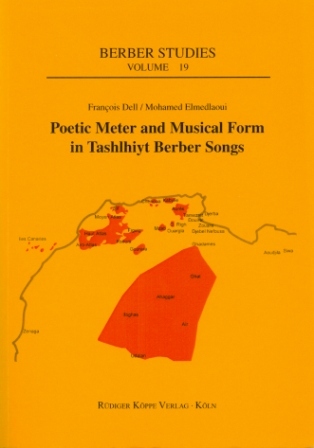 “Poetic meter and musical form in Tashlhiyt Berber songs” […] is an excellent case study on how words are set to music and thus deals with a research area at the interface between phonology and music […] A major finding of François Dell & Mohamed Elmedlaoui’s book is that metrical structure exists independent of musical structure in these songs. The authors find discrepancies between lineation and musical groupings, showing that division of a song text into lines is not a by-product of grouping structure in the musical domain. Despite the book’s highly technical prose, two peasurable components render it accessible to the non-linguist: the transcribed, transliterated, and translated sung poems themselves and the audio CD included with the book. The CD contains the chapter examples and the several songs transcribed in the appendices. In some of the song texts themselves the poets elaborate on the creative process of composing verse, using metaphors of masonry and carpentry to characterize the way words, meter, and tune must fit together to render a song successful. In others, the reader gets a glimpse into Berber/Amazigh culture, migration, longing, and other key themes in verbal culture in southwestern Morocco. The text is greatly enriched by this audio component.